We all are aware that GST is going to implement from July 2017. Now we all are just trying to analyse its impact on different Industries deals in various goods/ services. we may probably miss that what would impact casual dealer after implementation of GST. 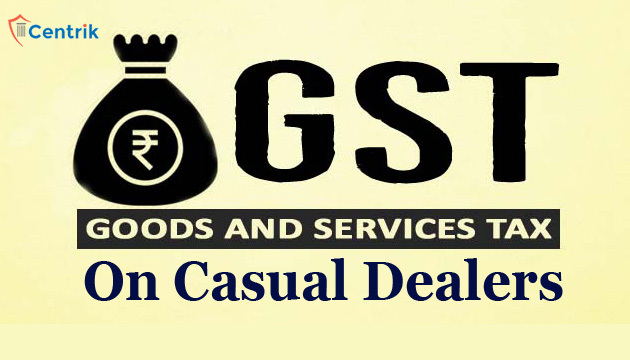 GST law provide specific provision for casual dealer. In this article we will discuss what is casual dealer, current compliances in Delhi VAT and Compliances in proposed GST. But before going further, it is important to know that who is casual dealer?? Current – As a casual dealer you need to apply in form DVAT 4A at least three days before commencing business in Delhi. You need to register regardless of the fact that what your turnover would be. At the time of registration dealer may also be asked to deposit security in the form of Bank draft. and if all the documents are found to be correct and in order, registration certificate shall be issued in DVAT- 6A. GST– In GST regime casual taxable person shall apply at least 5 days before commencing its business in form GST REG-1 irrespective of its turnover. As per MGL one major point to note here is that certificate of registration to casual dealer shall be valid for a period not more than 90 days which may be extended for further period of 90 days on request of dealer in form GST REG-25. So as per my opinion in case if casual dealer supplying goods/ services for more than 90 days than he has to make further application for registration. Current– In Delhi VAT it seems that its an discretionary power of department to ask to make advance deposit at the time of registration. GST– In GST regime it is proposed that casual dealer shall make an advance deposit of estimated tax liability for the period for which registration is sought. In GST regime it is strictly mention that if casual dealer have not filled any return that he supposed to file in GST will make him liable for not getting refund of any advance deposit if his actual tax liability is less than amount of advance deposit made by him. Current- In Delhi VAT casual taxpayer is liable to furnish only one return in form DVAT 16A after conclusion of total business in Delhi. GSTR-1 Details of outward supplies on or before 10th of the next month. GSTR-2 Details of Inward supplies on or before 15th of next month. GSTR-3 Final Monthly return on or before 20th of next month. Current– Delhi VAT provides for payment of taxes on daily basis on the sales made on previous day. GST –Date of payment in GST is not notified yet but as per my opinion it would also be on daily basis. Current – Delhi VAT provides that casual dealer shall not issue any tax invoice for the sale of goods, that means no dealer to whom any goods sold by such dealer shall be entitled to claim any Input tax credit. GST – GST regime does not provide any specific provision for the same. We can conclude that in proposed regime casual dealer need to register itself in every state from where he makes taxable supply irrespective of their turnover and now in proposed regime it would be more burdensome for casual taxpayer because its mandate filing of three returns on monthly basis. As casual dealer in other states what is clarity regarding the input tax credit. On outwards and inward.Please suggest. What if a casual dealer whose turnover is below 2000000 moves his goods from his home state to another in his car for exhibition or retail.what documents shall be his requirement? Dear, as per Waybill Rules, you need Eway bill if value of goods is more than Rs. 50000/- However, the system for e-waybill has not been activated in some of the State. For Example, in UP, your eway bill can be generated through its commerical tax portal. I have already registration in Bangalore and now i need to take casual regn in Kerala. The trade fair is conducted in a trade centre. What is the place of business I should mention in time of Registration? What is the proof i should attach? after 90days whether casual person have to file GSTR 10 and GST reg 16 . what is the cancellation procedure. i think voluntary cancellation may not be the case with casual dealer, as regn granded is only for 90 days.